It’s only been two months since HBO Studios put out the eighth and final season of Entourage on Blu-Ray and DVD. In the interim, the subscription cable company has wasted no time, spending the last several months planning an 18-disc behemoth of a full series set that will highlight some of the best and worst moments for Ari, Vince, Turtle, Drama, and E. Because a good chunk of Entourage as a show was about excess, the extras on the disc will follow suit with an extensive set of bonus features bringing up everything from Ferrari’s to Las Vegas trips. Unfortunately, we still have a while to wait before we are able to experience the overload onscreen in our own homes. 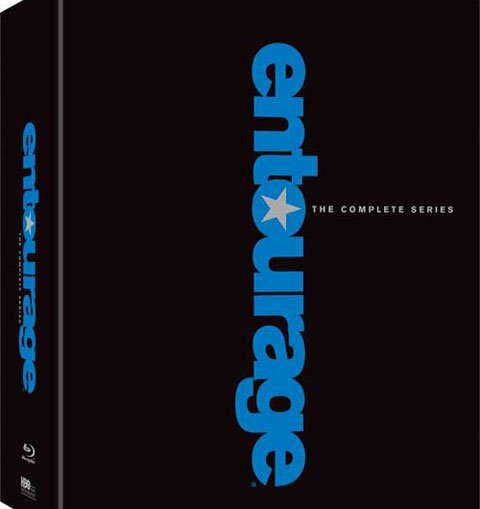 Entourage: The Complete Series will hit Blu-Ray and DVD on November 6th, no doubt making this a suitably timed Christmas gift for huge fanboys of the show. If you can’t quite wait that long to jump on the full series set, there is good news: both the Blu-Ray and DVD sets are already available and 10% on Amazon. If you’d like to check out the bonus features before you make a decision, we’ve got them, below. Entourage set cover art has always highlighted Vince and the other guys in the gang, which is why it is a bit of a surprise the full series set will not follow suit. Instead, HBO has plans to color code each set into a sleek black box with blue lettering for—you guessed it—Blu-Ray copies and red lettering for the DVD set. I’m not sure I love the look, but next to the white lettering on the spines of former seasons, it is sure to pop.